The Barra Brown Quintet (BBQ) is comprised of several notable figures from the Portland Jazz community. Bandleader, drummer and composer Barra Brown is a member of the newest surge of young musicians to develop a presence in the creative music scene here in Portland. A truly eclectic musician, Barra studied classical flute performance at Lewis and Clark while studying drum set on the side through the prestigious Alan Jones Academy of Music (AJAM). Barra has also toured the continental United States and Alaska with indie-folk group “Alameda,” and released one record with “Wishermen,” a collective of young jazz heavyweights dedicated to exploring genre boundaries and creating a new amalgam of many styles and influences. The BBQ is Barra’s newest enterprise and has the distinction of being the only group dedicated fully to realizing his vision as a composer and as a player. The sidemen’s credentials are no less impressive. Trumpeter and recent NYC transplant Tom Barber is the senior member of the group, bringing his finely honed sensibilities and instrumental prowess to the fiery young ensemble. Saxophonist Nicole Glover has been quickly rising through the ranks here in town and has picked up gigs at home and abroad with Alan Jones, Esperanza Spalding, and George Colligan. Bassist Jon Lakey has become the most ubiquitous upright player of his generation. Guitarist Adam Brock, after studying jazz intensely at the university level, has moved on to pursue a burgeoning career as a singer-songwriter. Barra was able to convince Adam to revisit jazz, and Adam brings an accessible element of rock and country influenced electric guitar work to this vibrant, dynamic collective. The compositions and group interplay create something greater than the sum of its parts: a sensitive ensemble presenting epic, sweeping compositions with finesse and subtlety. 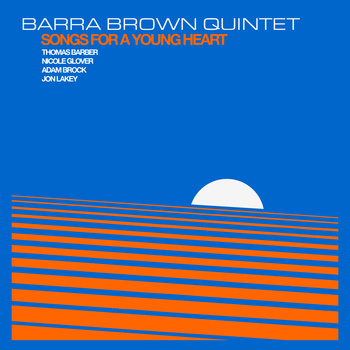 “Songs for a Young Heart” is an impressive debut, and Barra Brown’s career as a bandleader is off to a roaring start.